When Joseph and Mary made their home in Nazareth, in the Lower Galilee, it was only a tiny Jewish village. Today it is the largest Arab town in the Galilee, housing both Christians and Moslems. Nazareth is holy to Christians for, according to the New Testament, it was Jesus’ hometown. 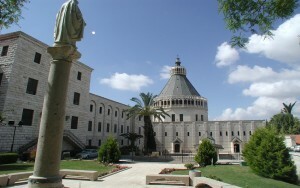 There are several famous churches in Nazareth, with the Catholic Church (or Basilica) of the Annunciation one of the holiest in the Land of Israel. 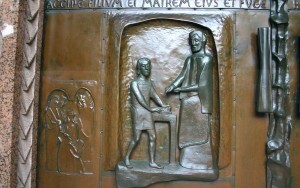 Early Christian tradition holds that the church was built on the site at which Mary was told that she would bear the child Jesus. A Greek Orthodox church stands at a local spring, where the angel Gabriel, according to tradition, first appeared to Mary. Here are a few pictures of your very grateful and happy clients. You made our journey a pleasure and always concerned yourself with our comfort. Again, thanks for the wonderful hosting. We will definitely utilize your services next time and refer our friends to you. Please do not hesitate to let us give you references, Best Wishes from Canada, Bob and Katie.